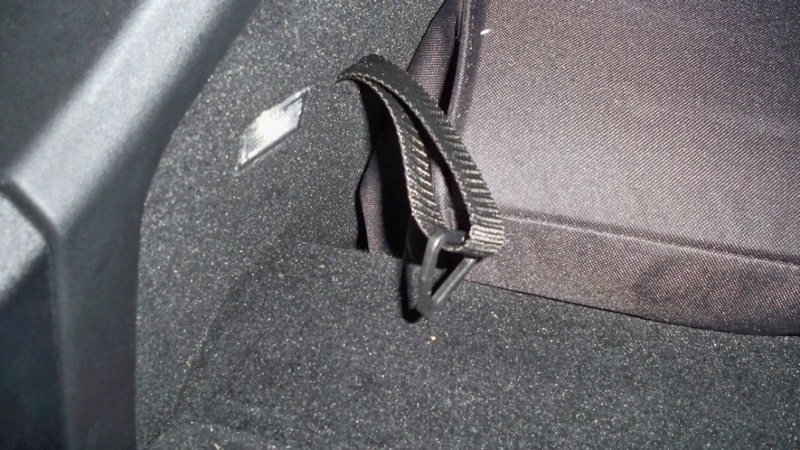 After seeing I was not alone with wishing there were a few tie-down straps in the trunk, I decided to do something about it! This project adds 4 straps on each side of the trunk. You may elect to skip some straps, depending on what you plan to use them for. 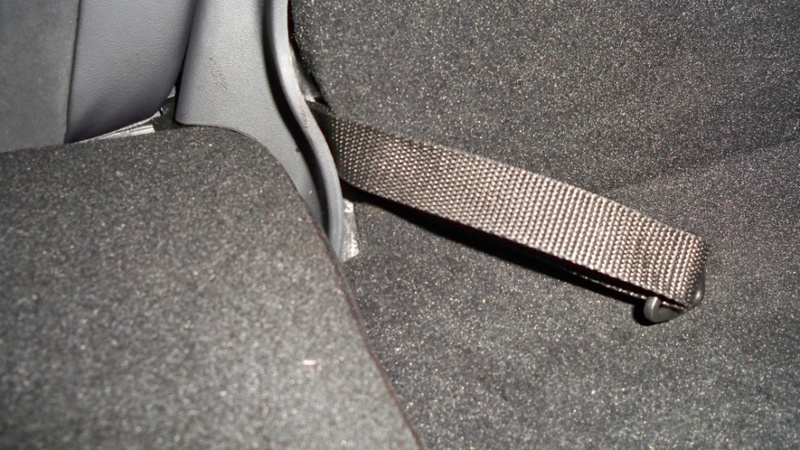 Only the rear-most straps require drilling holes in the body. 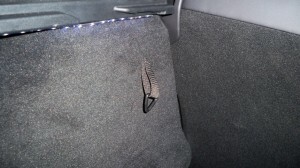 I had already pulled back some of the felt/mat material along the sides and in the corners of the trunk. (I was adding puddle lamps from the doors to the inside of the trunk because mine was missing these lights). 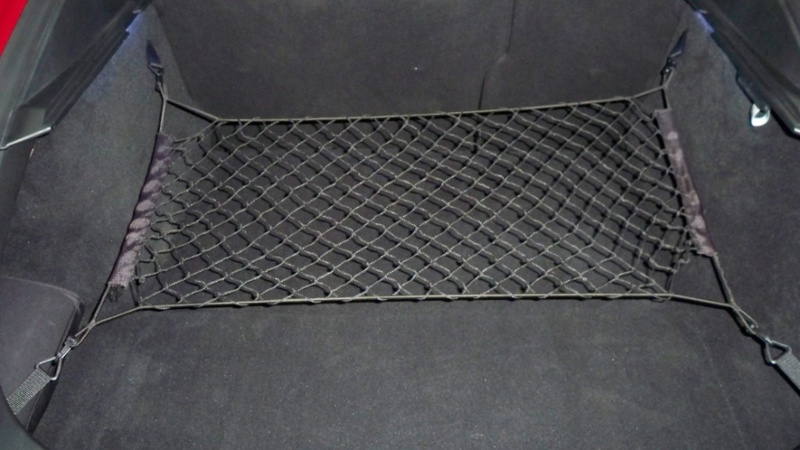 I had a roll of 1” nylon strapping lying around in my supplies. 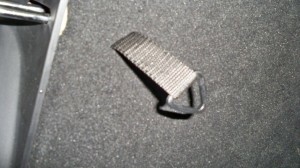 And I had some plastic, I call them V-Rings, since they are not exactly D-Rings. I had picked up the plastic V-Rings at a marine supply store but you can order them on Amazon or most hardware stores as well. I took some rough measurements for length and cut the strapping. Most were 8.5 inches long for the sides. In the rear near the trunk LEDs I used a 16” strip. With a lighter I melted the ends of the straps to prevent unraveling. 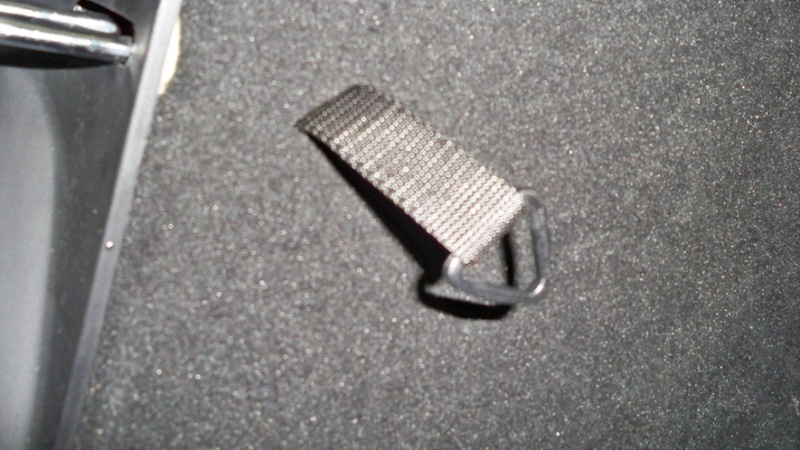 I threaded the V-Ring with the strap and drilled a hole through both ends near the two ends. I was ready to push a screw or bolt through. Remove the parcel shelf. 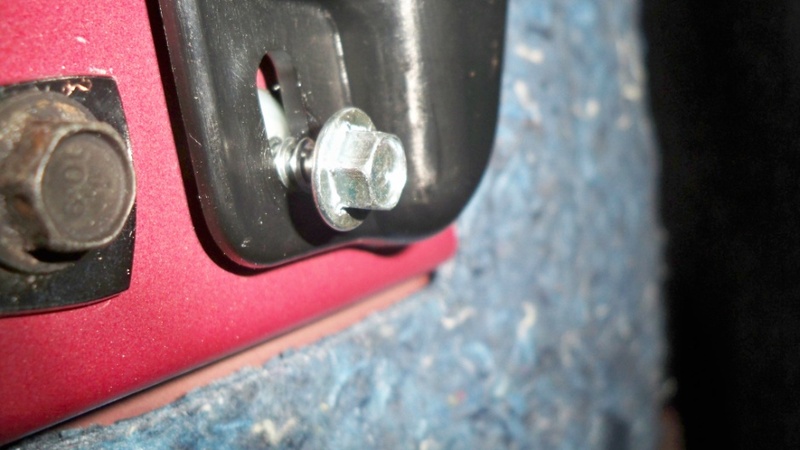 Remove the parcel shelf holder by rem0ving one screw and pull outwards to release the snaps. 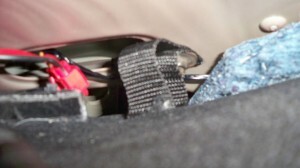 This exposes a plastic pushpin securing the side panel. 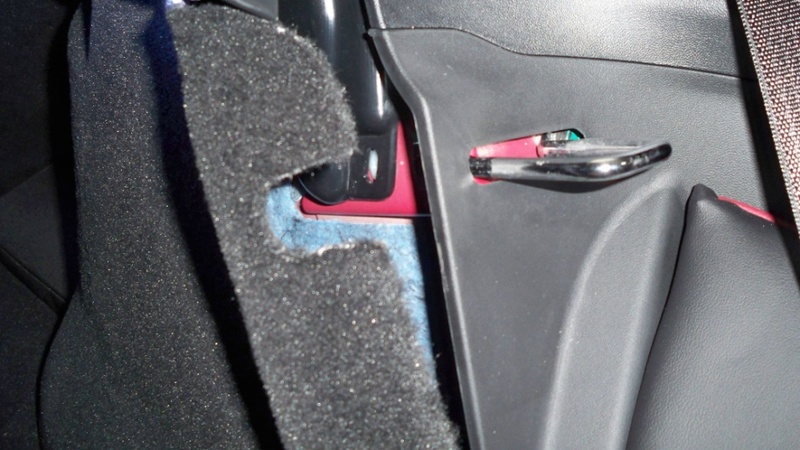 Remove the pushpin and you can pull the panel open where the seat meets the front of the trunk. Looking behind the side panel near the U-bolt that holds the back seat secure, you’ll see a self threading bolt that screws into a nylon nut in the body. 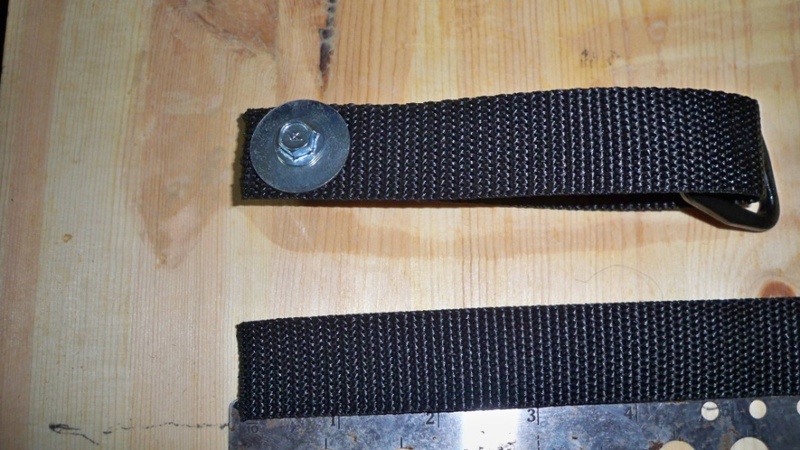 Remove it with a 8mm socket and use the bolt to secure the strap. I used a box cutter to cut a slit in the side panel for the strap to be exposed on the inside of the car. 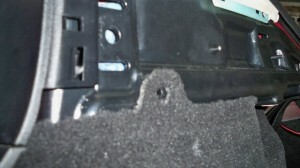 Next I found a place under the parcel tray bracket near the end where the parcel shelf bend occurs. 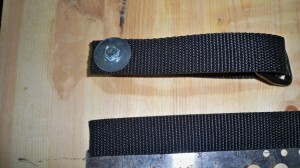 I drilled a ¼” hole and threaded a screw through another strap with a flat washer on each side and through the bracket. 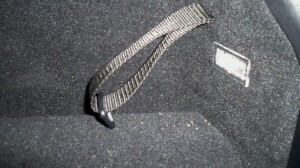 Now, I have another V-Ring tie-down strap half way to the rear of the trunk. The black nylon strap attached to the parcel shelf bracket. 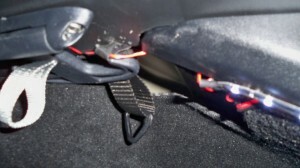 The red/black wires were from the added trunk lights (a different project). For the third strap, I removed the plastic trim half up the inside of the trunk. These pop out as I lifted the rubber weatherstrip. Then I turned the trim at an angle to give me room to pull back the felt/mat. 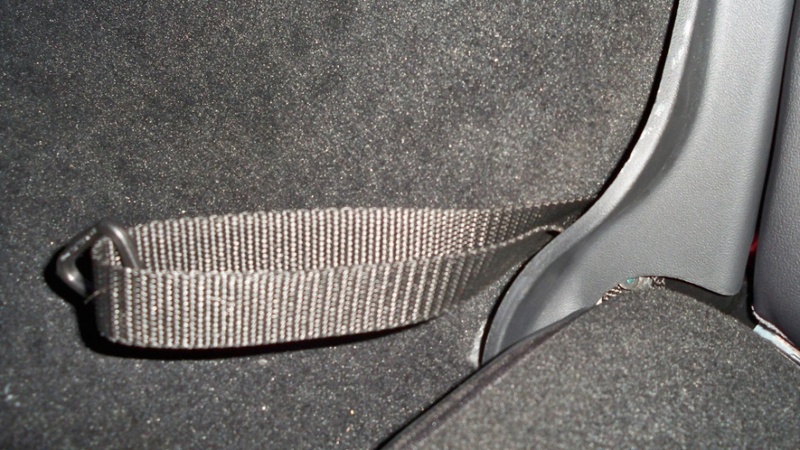 The trim stays attached to the trunk lip at the bottom. Now with a little effort I peeled the inside felt/mat panel to expose the inside of the tail-light. 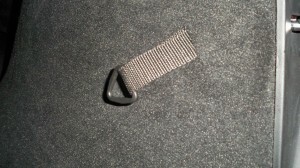 I found an inside metal panel with plenty of space without touching the outside metal of the car. (I didn’t want to drill through my car’s body to the outside, did I?) Using a 3/16th bit I drilled through the mat about where the drill would penetrate and then continued to drill into the inside panel. 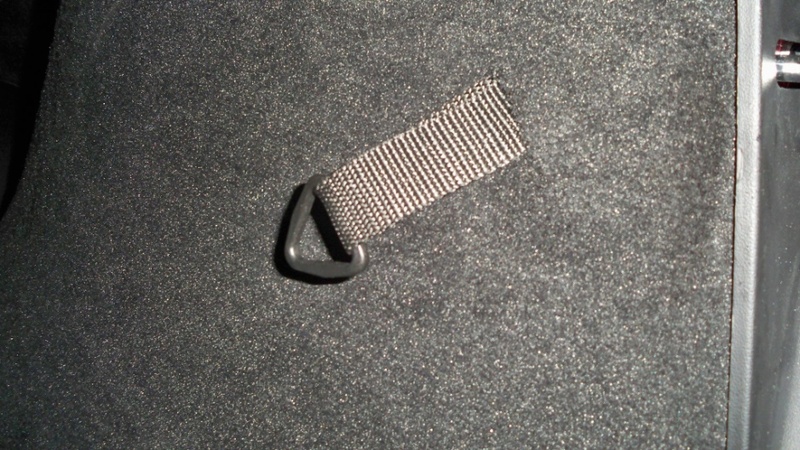 Using a box cutter, I enlarged the hole in the felt/mat to a slit for the strap to feed through. I put a self tapping screw with a flat washer through the strap into the inside metal panel and tightened it down with a ratchet. I used a 16” length of strap so when folded it would give me an 8 inch tie-down. That turned out to be just about right although the prior straps were half that length. This is view of the right inside corner of the trunk with the felt/mat pulled back and the strap already drilled and attached with the self tapping screw. Then I did the same for all three straps on the other side. We now have three sets of tie-downs! 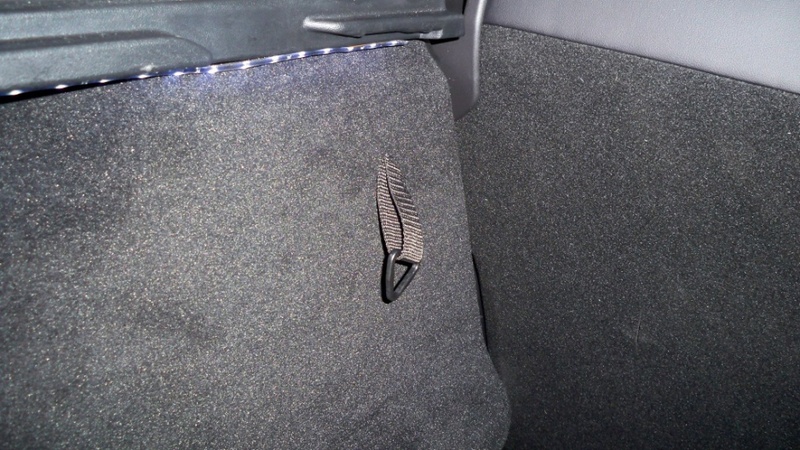 One sticks out near the top of the seat back, one is under the lip of the parcel shelf, and the last is near the inside trunk lens/light. I don’t expect these straps to be secure enough to help me airlift my MS, but they will hold down stuff I put in the truck and hold with bungee cords or a stretch net. 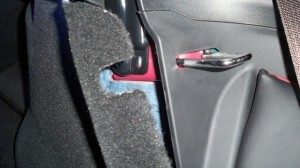 After these three sets were installed, I saw the need for another set near the floor and just behind the rear seats. Sorry, there’s no pictures of the before or during of this fourth set. The bolt for the mounting is hidden. You will understand when you look for yourself. 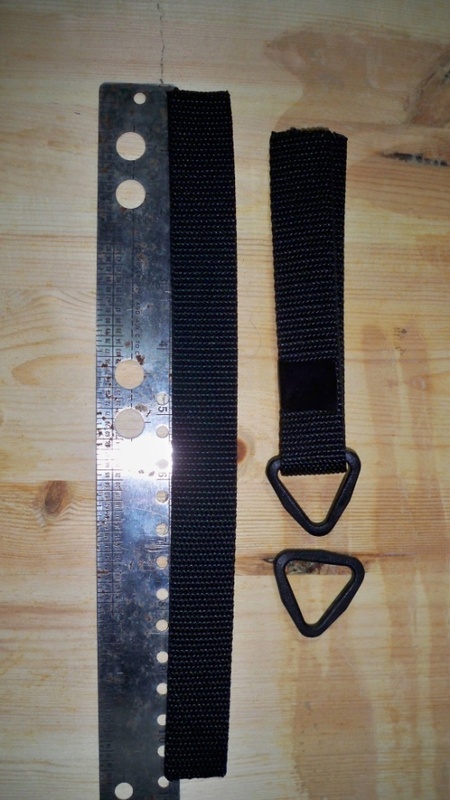 I measured a piece of strap about 20 inches long, drilled the holes through each end and threaded the V-Ring. Using a 11mm socket I removed a bolt that secures the bottom of the rear seat to the body. This bolt’s threaded diameter is about 3/8ths of an inch. Pushed the bolt through the hole and screwed it back in. Once you see where the bolt is, you are going to realize this is harder than it sounds. I had to use a large 18” long screwdriver to hold the plastic trim out of the way to allow the socket to fit over the bolt head. First one always takes longer, (45 minutes) than the second one (10 minutes) once I had the technique. 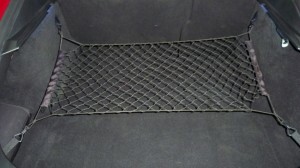 This the final result showing two of three straps on each side used with a small net. This is before installing the final two straps low behind the seats. As with all our projects, we do not believe any of these changes will affect your warranty. At the same time we’re also not going to take any responsibility should this not be the case and/or you screw up and damage your car! If you’re comfortable working on cars, you shouldn’t have any problem with this project. I did a project of my own stimulated by the above project. 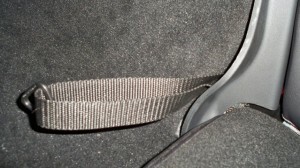 This is a simple tie down for the frunk and a more involved tie down using the tie down hard points used for the 3d row seats which are otherwise not provided without that option.